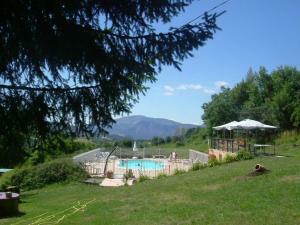 You can admire the panoramic mountain views from the outdoor swimming pool and the garden at this renovated farm. 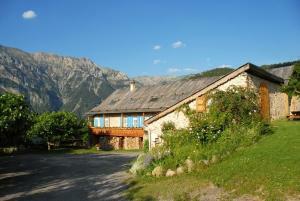 It is located above Lake Serre-Ponçon, 40 km from Ecrins National Park. Free Wi-Fi and a TV are provided in the guest rooms, which feature a chalet-style decor. Each room offers a view of the Alps Mountains and the private bathrooms include a hairdryer. Traditional cuisine is served in the restaurant at Hotel Pension Rolland, and you can choose between a continental and a buffet breakfast. An pétanque area is provided and an outdoor hot tub is opened from June to September. A sauna is also available with an extra cost. Private parking is free on site and the Ubaye Valley is 11 km away. Leisure activities in the local area include kayaking and hiking. Set on a 15-hectare park, Domaine Le Prayet is 5 km from Saint-Jean-Montclar Ski Resort and 25 km from Barcelonnette. It offers a self-catering studio, individually decorated rooms and a terrace with outdoor furniture. All accommodation types feature exposed beams, mountain views and wooden floors. The bathroom includes a shower. Guests staying in the rooms are invited to enjoy breakfast every morning at Domaine Le Prayet. Meals prepared by the hosts can also be served if you request in advance. The studio features a kitchenette with a stove, an oven and a fridge. Massage treatments and lithotherapy sessions can be arranged at an extra cost. Free private parking is available on site.